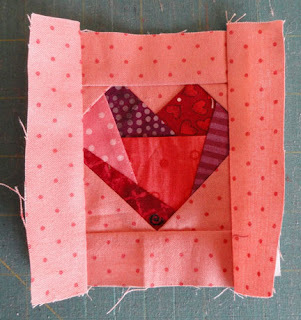 This tutorial begins with machine paper foundation piecing of the Section 1: Scrappy Heart Block. Prep step: Cut out one foundation of this block from your photocopy, leaving a scant margin BEYOND the outer solid line (which is the final trim line). 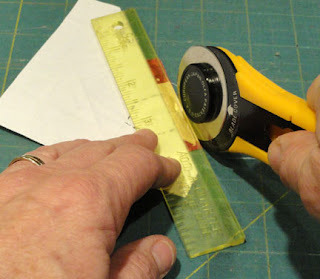 Use a bookmark, thin plastic ruler, or equivalent as a folding tool. Lay tool on the face side of the paper section, along each interior line and crease. See how the paper is being folded print side to print side. solid stitching lines, stitching order numerals, fabric or color designations, & dashed seam allowance indicator line near outer solid line. Step 1. Identify patch #1, and its color. Step 2. Look at the shape of patch #1 from the backside (defined by creases in prep step). 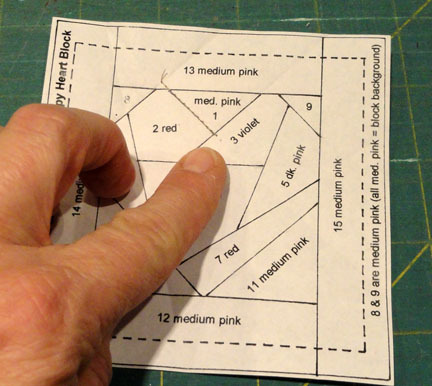 Free-hand cut a patch from indicated color, adding a generous 1/4" seam allowance to the creased shape size. Step 3. 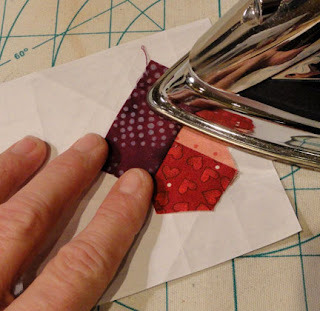 On the backside of the section foundation paper, use a little dab of fabric glue stitch to position and attach the backside of the cut patch in place. I have traced a dashed line on my crease lines to show #1 shape. 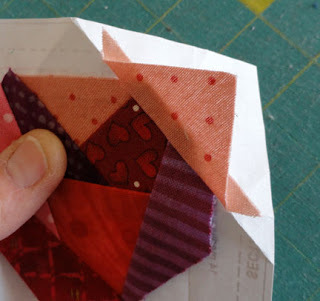 Make sure the shape is centered within the fabric patch boundary edges. Step 4. From the front, locate patch #2 and identify fabric to be used. Locate the stitching (solid) line BETWEEN #1 and #2. This is the TARGET stitching line. 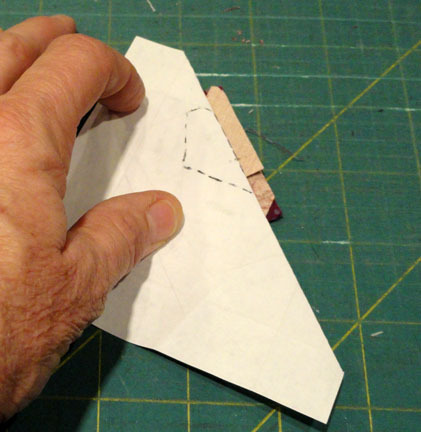 Fold the paper along that crease. Keep the shape to be added - patch #2 here - as the top layer, so it will remain MOST VISIBLE. Position section (with patch #1 in place) over the fabric with crease a generous 1/4" in from cut edge. 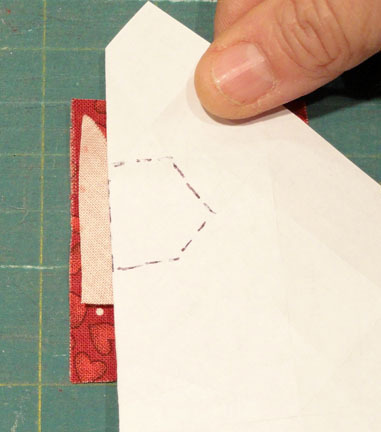 Make sure the target PATCH SHAPE will be contained within the fabric cut edges. Positioning checker: Note how the patch being added AND the patch already in place are RIGHT sides together, as in conventional piecing. 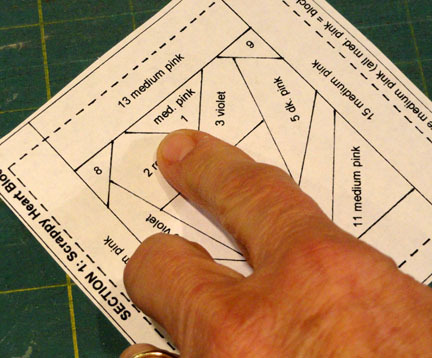 Once this positioning is achieved, carefully UNFOLD the paper diagram without letting anything shift. Step 6. Adjust machine straight stitch length to 14-16 stitches per inch (about half conventional piecing stitch length). Load machine with neutral beige or gray thread. Insert needle 2 stitches before the actual beginning of the target line. Stitch EXACTLY on the line . . . . .
. . . .then stitch 2 stitches beyond the actual end of the line. 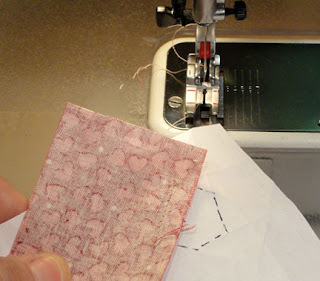 Do not backstitch at beginning or end of "seam". Here you can see the stitching just completed from the backside of the diagram where the fabric patches are being added. Step 7. Press the fabric patch #2 back along seam. It will now be in position to cover the crease-defined shape #2. To check that this is the case, pick up the foundation and with the print side toward you, hold it up to a light source. You will be able to see "through" the paper enough to see the fabric outlines. 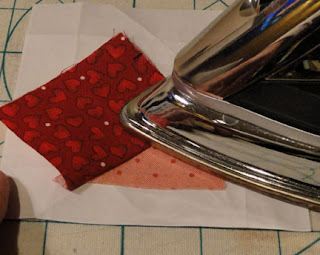 Just make sure that the creased shape falls within the fabric edges with enough allowance to trim back to 1/4" all around. Step 8. 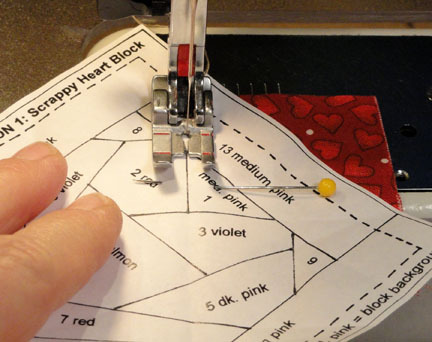 Fold back the diagram along the most recent stitching line/crease. Use rotary equipment to trim excess to 1/4" beyond crease. 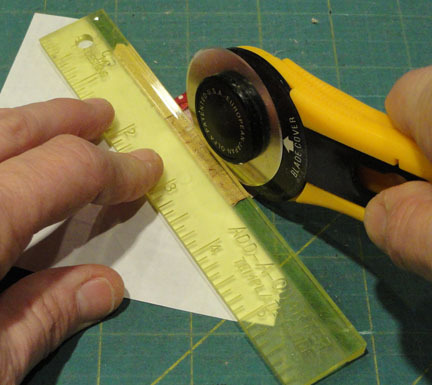 The ruler being used here is "Add-A-Quarter" which has a 1/4" ridge on the bottom that will "catch" against the thickness of the paper fold to assist in quickly making this cut. 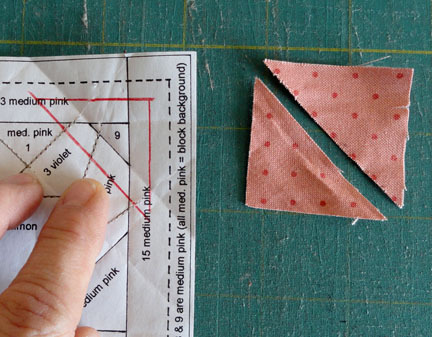 Continue folding along each crease that defines patch #2 and trimming 1/4" beyond paper fold. (For patch #2, there are 6 sides to the shape.) Many of these trims will involve ONLY patch #2 fabrics. Step 9. Identify patch #3 and its stitching line (between #3 being ADDED and numbers 1 & 2 which are already IN PLACE. 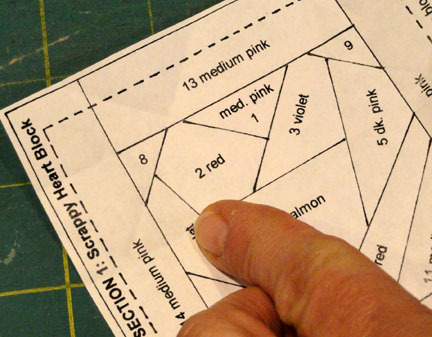 Fold paper diagram along that line. Note that as you fold, the stitches at that end of the previous seam will need to pull free (or un-do themselves) to allow this process. This is the correct result. Step 10. Repeat Step 5 to position the #3 shape as seen from paper backside (pen-dash outlined for this image) over the FACE-side-up fabric. 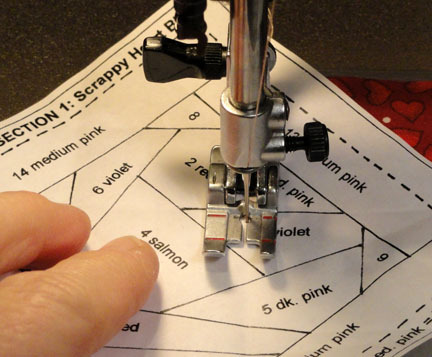 Repeat the unfolding, stitching, pressing and trimming processes in Steps 6-8, this time for patch #3. This image shows patch #3 being pressed back into final position. 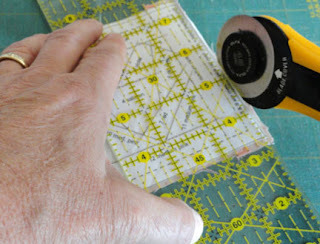 Next comes: repeating the visual check, turning diagram over on cutting surface to sequentially crease on stitching line to trim 1/4", and all of the other lines that define the shape for patch #3. This is the process to join the remaining patches through #7 that create the Scrappy Heart Block. Here you can see the completed heart patchwork (along with background patch #1). Now we will add the background shapes which involve "half-square" triangles and strips. Grain line selection has been more or less left to chance up to this point. Now we will add more information about using better grain line choices. Step 11. Identify the next patch, #8, and the target seamline between it and previously-attached fabric patches. Since it is a triangle that is the shape attained when dividing a square on the diagonal, a patch can be easily pre-cut then easily joined. 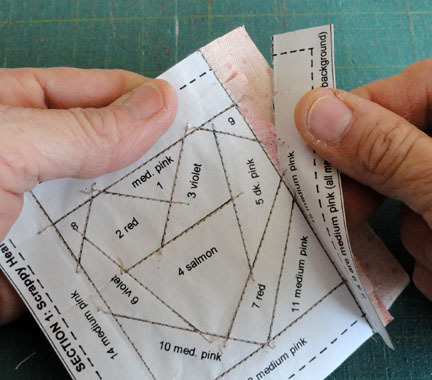 If the fabric is NON-DIRECTIONAL, the process produces 2 triangles, so one can be used for #8 and the other for #9. Step 12. Envision the size patch that will be required. Easy geometrics like these triangles work well with this shortcut. I have traced a RED line around my shape that includes the 1/4" seam allowance. If I use a ruler to measure the hypotenuse legs of the triangle (top and right side lines that connect at the right angle corner), I can figure the square that would be required. My calculation is a 1 1/4" square, but I need to bump it larger to allow for some trim and some safety. 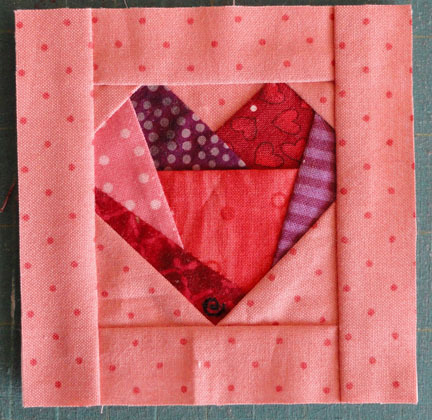 So I cut my single background (pink) square 1 3/4" x 1 3/4", then cut it on the diagonal, too. Step 13. 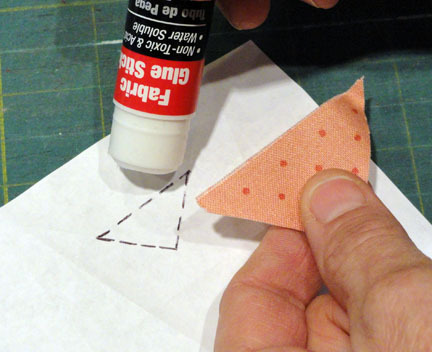 Now position the triangle as for the other patches, that is FACE up on the work surface. The paper foundation is folded on the target seam line crease. Position the #8 area (shown outlined in red pencil here) over and within the shape of the triangle. 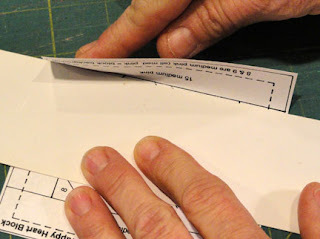 Once adjusted, paper is unfolded carefully, then the seam stitched as before. Here you can see the #9 shape which has been stitched-to-join, then pressed back into position. Follow the same steps for #8 and #9. 2 5/8" x 2 5/8" (increasing this from the measured required triangle edge at 2 1/8"). Step 15. Add remaining patches to complete the block - #13-15. 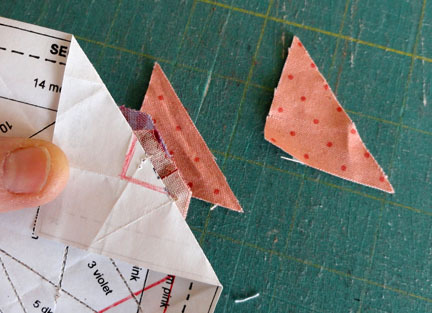 Cut strips that are adequately wide (such as 1 1/4") and appropriate lengths, cut one strip that is long enough to complete all four block sides, or work from the edge of the yardage. There is only one small difference to NOTE: for #14 & #15, the ends of these seams will NOT be crossed by any additional seams. Therefore, stitch on the lines, but BEGIN at the paper edge, stitch across, then END by stitching off the paper edge. This image shows the untrimmed block with ALL the fabric patches in place. Step 16. Turn the foundation to printed side up. Use rotary equipment to trim away excess EXACTLY on the outer solid "trim" line. Trim all four edges. Now turn over your Scrappy Heart block and do some admiring. You have earned it! Step 17. Remove the paper foundation from the fabric patchwork. To do this, work from highest number to lowest. We begin here with #15. 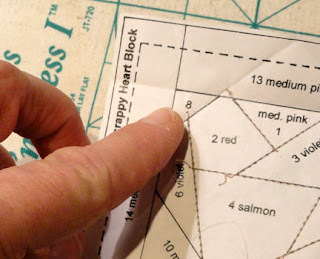 Refold along the line/crease, then begin at one end to tear the paper away along the perforations created by the stitching. Continue working to next lowest number patch, flexing the paper slightly to help the paper pull away from the stitching. 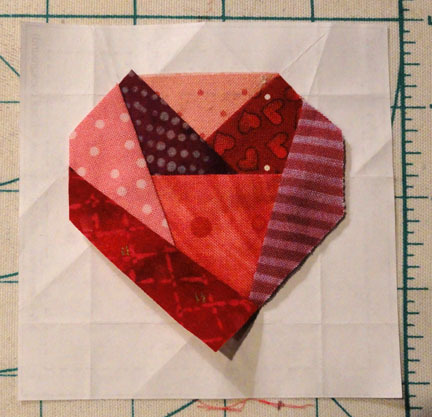 View other tutorials for other parts of this pattern project, including a comparison of the smaller machine paper foundation blocks, checker & fusible hearts panels, layering and machine quilting, and ribbon insertion at the upper binding seam.